My favourite TV show in my teens was without a doubt The X-Files. I spent countless school nights and weekends watching literally every single episode with my mom. I admired Mulder's determination in his search for the unknown and I admired Scully's scientific knowledge and need for evidence. When I see a new X-Files game I simply can't resist, even when it falls into a category of games I wouldn't typically consider adding to my collection. Separate the cards into two decks: Evidence and Conspiracy. Shuffle each deck. Each player draws 3 evidence cards to form their starting hand. The player who most recently experienced Deja Vu becomes Agent Mulder for the first round. The remaining players act as the FBI tribunal. The player acting as Fox Mulder draws a conspiracy cards, reads it outloud and places it faceup in view of all players. Each tribunal member plays 1 Evidence card face up next to the conpiracy card. Mulder has 30 seconds to consider the evidence. Using ALL the evidence provided Mulder must create a plausible explanation to the conspiracy. Without discussion, the tribunal votes on wether or not they believe Mulder. To vote all players count to 3 then reveal a thumbs up for believe or a thumbs down for disbelieve. 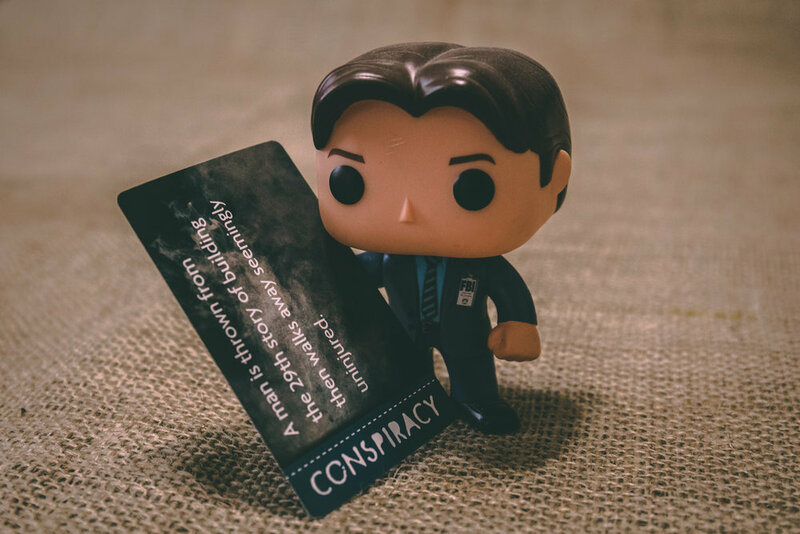 If the majority of the tribunal believes the conspiracy theory then Mulder earns a respect point (Set the conspiracy card to their side as a score pile). All tribunal members who voted with the majority earn a respect point (Set their evidence card to their side as a score pile). After voting tribunal members may discard 1 evidence card then draw back up to a handsize of 3. The role of Mulder passes to the left. The game ends when all players have taken the role of Mulder twice. The player with the most respect points wins the game. If there is a tie, the player with the most conspiracy cards in their score pile is the winner. The game components, cards with words on them, are very minimalistic. If you're here for some cool art, that is not what you are getting. The game is very much an improv/story prompting game. You must be prepared to get creative. This comes easily to some but not to me. I'm creative but I struggle when being put on the spot. 30 seconds is not a lot of time to assess the evidence, especially if you're playing with 7 tribunal members. My personal preference is to scrap the time restraint and just have fun with it. Many of the evidence cards are pretty out there. I recommend having a phone with Google ready to go. Many of the cards refer to episodes of the X-Files but are so obscure that even if I had watched it recently I likely still wouldn't remember what they are. Is it weird that I kind of like that? It shows just how much thought was put into the evidence cards. It is crucial that players vote on whether or not they believe the conspiracy theory and not try to assess how other players might vote. It's fun to laugh and talk about it after voting but trust that it's much more fun when you vote honestly. As far out of my comfort zone as this game was I had a really fun time playing it. My conspiracy theories were no where near as good as what my friends came up with but I'm okay with that. If you love the X-Files and you love a good impromptu session you'll want to check this game out. This would also make a great convention game. As always thank you for reading. Leave your questions, comments and thoughts below.